Ross Wilson is probably the only person in Australian rock music who can’t make a comeback simply because he’s never been away. In a career that spans over 40 years Ross remains one of this country’s most respected artists. 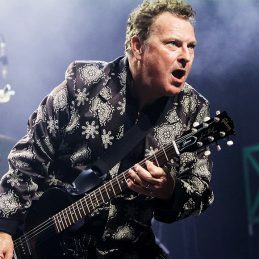 From Daddy Cool to Mondo Rock, as a solo artist, or as songwriter of A-grade classics such as Eagle Rock, Cool World and A Touch of Paradise, or producer of the legendary Skyhooks, Jo Jo Zep, The Johnnys, & more recently The Screaming Jets, Ross’s involvement with success has continued unabated. He fronted Daddy Cool & exploded out of the 70s playing rootsy 50s sounds. Then formed Mondo Rock who surfed the contemporary scene with chart topping singles & albums from the mid 70s to the late 80s. As a solo performer and major songwriter he continued to achieve success & make his mark during the 90s & beyond with his songs being recorded by artists as diverse as Jimmy Barnes, John Farnham, DEF-FX, Custard, Jennifer Rush (EU), Troy Cassar-Daley, Leslie Avril, Hey Gringo, You Am I, Uncle Bill, Keke (Spain), Renee Geyer, Christine Anu, Duane Jarvis (US), Elkie Brooks (UK), Ann Kirkpatrick & Lee Kernaghan, Sovereign, Pleasantville, Beccy Cole, Sonic Jihad, and The Wiggles! On trips to Europe & the USA he collaborated with O/S writers & concluded the millenium as a special guest performer on John Farnham’s “I Can’t Believe I’m 50″ tour & live CD/DVD.